Since it was founded over 30 years ago, Biotop has committed itself to the judicious use of water, an element that gives us both life and deep enjoyment. 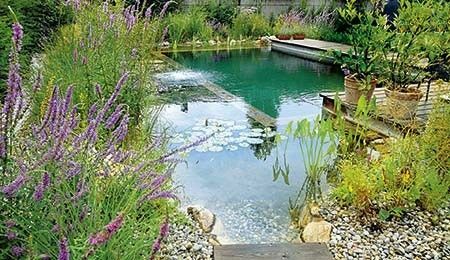 For many people having pure natural water in their own garden for either swimming or its simple beauty is a dream come true. Biotop’s approach copies nature, using only ecologically sustainable building components and recycled products. All of the partners in our network make up a community that has been steadily growing and sharing a common goal. All those who understand the Austrian pioneer Biotop’s values and philosophy will equally appreciate the beauty and power of nature when water becomes an element in garden landscaping design. For our benefit, and for our natural environment. A company with an ecological focus can also have a viable economic future. This was our vision for the first several years. The Natural Pool was only one of many ideas, but without a doubt it was the best. Not only did Biotop come across this idea half a decade before anyone else, Biotop has also been the most innovative system provider right from the start. 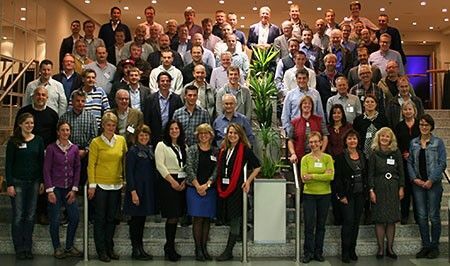 Biotop began establishing its Natural Pool partner network as early as 1994. At that time, Biotop had already gained ten years of experience building Natural Pools. With the support of its partner network Biotop has succeeded in offering its customers a high-tech product that meets high quality standards. More than 5,000 satisfied customers testify to the unmatched quality of our Natural Pools. The continuous development of our system is our daily goal. In pursuing that goal, we always make sure we work with nature and not against it. ‘Use nature intelligently without exploiting it’ is our motto. We refuse to make Natural Pools too dependent on technical equipment, as that clearly contradicts the fundamental idea of a Natural Pool. Our inventions are often copied, but the original remains unmatched. That is because we are continually working to take our products to the next level. 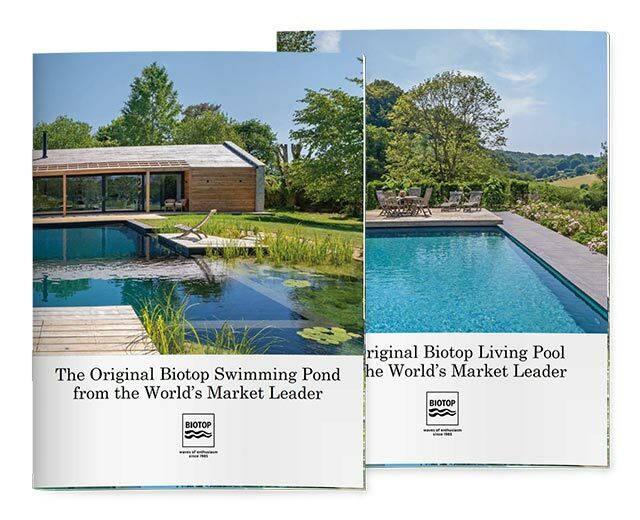 Our pioneering approach to innovation makes the Biotop Natural Pool Group the market leader. Your needs and desires are of the greatest importance to us, and togetherwith our partners and Biotop, we will plan and build your dream Natural Pool. Our involvement in your Natural Pool does not end when construction is finished. We are the only Natural Pool builders to offer comprehensive support and consultation in the post-construction years. We maintain a close relationship with our customers because we see an opportunity here, to learn about customer needs and wishes first hand. For us, staying in touch guarantees that we can continue to improve the Natural Pool in line with what customers want. Satisfied customers are our future. A large number of motivated partner companies are our future. Well-trained employees are our future. Upholding ecological principles is our future. By relying on quality, the Biotop Natural Pool Group is consistently working to improve the future of the Natural Pool, from which you as a customer can only benefit. Choosing a Biotop original is simply the better choice in the long run.